A week after Hurricane Maria pummeled Puerto Rico, the island is facing a widespread humanitarian crisis. The country is home to 3.4 million people. By the time Hurricane Maria made landfall in Puerto Rico, it had been downgraded from a Category 5 to Category 4 storm, but it tore across the island with the force of a 50-mile-wide tornado. On top of extensive damage to homes and buildings, the island has an acute lack of water, food, fuel, and medical care. Millions of people still don’t have access to a power grid, and only 25 percent of cell phone service has been restored. An estimated 60 percent of people don’t have access to potable water. In many places, there is no water at all for drinking, bathing, or flushing toilets. Many stores are running out of food and water, and others cannot stay open without fuel for their generators. Contact was established with 15 of 25 churches on Puerto Rico’s East District; the other 10 are still unreachable. Communication out of the West District is even more limited. Several churches across the island have reported damage to buildings, and many families have lost their homes. No loss of life has been reported. 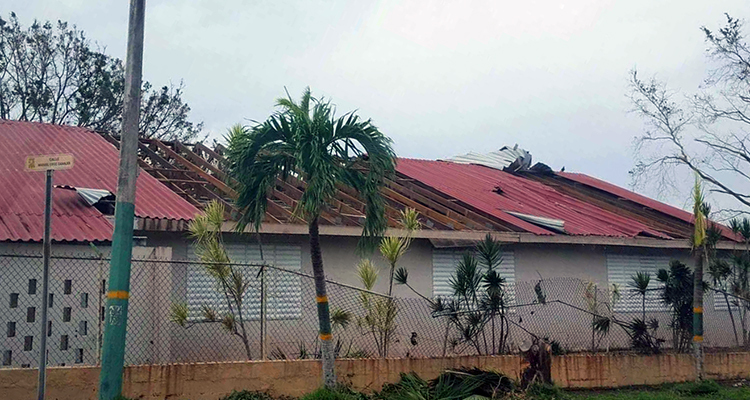 Local Nazarene churches in Puerto Rico began mobilizing to respond to needs in their communities soon after Hurricane Maria passed through. The Loiza Valley Church of the Nazarene offered meals to their community and collected resources to distribute to those in need. The Cataño Church of the Nazarene has been actively volunteering in shelters for more than 300 displaced residents, including providing children’s activities. Throughout the Caribbean, several island nations have been battered by Hurricane Maria and Hurricane Irma, which came just days before. Dominica experienced massive devastation when Maria swept through as a Category 5 hurricane. Nazarene leaders are reporting that churches and many homes were damaged extensively. However, not all of the churches have been accessed, and the full extent of damage is unknown. Food, water, and fuel are critical needs. Following Hurricane Irma, the entire island of Barbuda remains uninhabitable, and at least 75 percent of Nazarene church members in St. Martin lost their homes. The storms also caused serious destruction in Cuba, the U.S. Virgin Islands, and the British Virgin Islands. Since so many islands are cut off from aid or travel, the entire scope of what is needed is still largely unknown. In Puerto Rico, the immediate needs are food, water, batteries, fuel, and shelter. Nazarene Compassionate Ministries is working toward getting supplies to the island. Because of extremely limited travel, churches are still unable to receive volunteers. Financial support and prayers are what is most needed right now. For more on Nazarene disaster response efforts following Hurricane Maria updates, visit ncm.org/Maria. The Puerto Rican Federal Affairs Administration has urged anyone seeking “general information or assistance” to email their office at maria1@prfaa.pr.gov. The American Red Cross also offers a “Safe and Well” website, a free public reunification tracker. They are encouraging people to search for loved ones and mark themselves as safe. Register and search directly on the website, or by texting SAFE to 78876. To speak with someone at the Red Cross concerning a missing friend or relative, contact 1-800-Red-Cross. Please pray for those facing devastation, which will take many months, if not years, to repair. Pray for those who have lost loved ones and the many people without homes. Pray for the recovery of the places that have been hit hard and the swift delivery of the supplies and care they need. Pray for those who are most vulnerable, especially senior adults, individuals with disabilities, and people living in poverty. Pray for church leaders and churches responding to the needs around them. To send a prayer or note of encouragement, go to ncm.org/pray. Because of extremely limited travel, churches in Puerto Rico are not yet able to receive volunteers. Anyone interested in helping with recovery efforts once churches are able to receive people may fill out a volunteer information form at ncm.org/Maria.